I'm nothing if not constantly inspired by everything I come across on my weekly (okay, nightly) Instagram binges. Whether I'm looking to what cool girls on the platform are buying from our favorite retailers like Shopbop and Zara or uncovering those fashion brands on the brink of blowing up, nothing gets me giddier. For someone who scouts the internet every day for the best shopping, uncovering a new-to-me brand I'm infatuated with is a serious thrill. Lately, my Saved folder has been racking up a lot of new jewelry designers that seem to have a completely fresh perspective. Each of their designs feels undoubtedly original, a tough feat in the current age of near-identical gold hoops and stacked rings. From the sculptural, art-inspired rings to the quirky charm anklet you didn't know you needed, I'm sharing eight new brands you might not have heard of yet but definitely will soon. 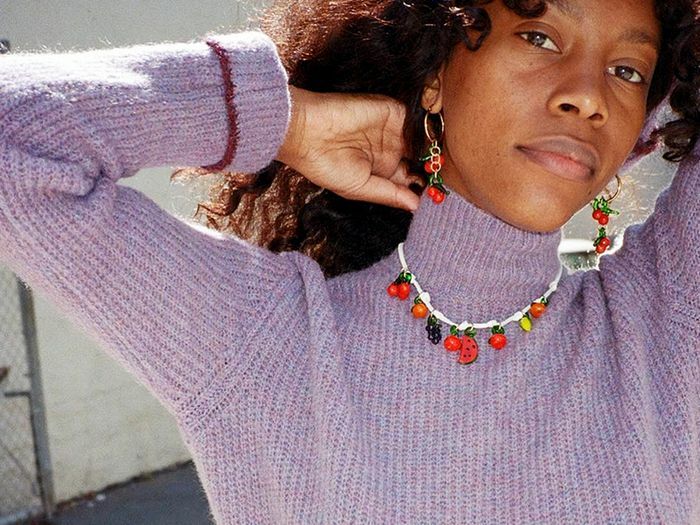 Go ahead and stalk the following indie jewelry brands at your leisure. With love, from my Saved folder to yours. @oursecondskin is wearing the Pebble Rings at #stockholmfashionweek right now and it’s making me very happy ???? I'm usually not a fan of mixing jewelry metals, but as soon as I came across Alex Jewelry Studio's smoothed Pebble Rings, nothing made more sense to me than wearing silver and gold together—at least if it looks like this. Not all jewelry need be so serious. One look at Alteria's quirky, cheerful designs confirms that even something small like a fruity anklet can lift your mood. Detail from @bode Indo-Canadian, Spring 2019 Presentation. Featuring Prounis Calda, Chorda, and Nona Cigar rings. Each piece of Prounis Jewelry's beautiful baroque designs is handwrought in NYC but has an altogether worldlier quality. Ariana Boussard-Reifel's sculptural pieces are beloved by everyone from celebs like Solange to fashion girls like Giovanna Engelbert. A beauty wearing our Love is Love Earrings ???? Meet your next party earrings—from rainbow colors to kitschy heart shapes, Tuza's designs will have you channeling your inner fun girl. Naida C. Castel's hammered metal and organic shapes make every necklace, ring, and earrings a standout piece. @maria_bernad with Knot earring and pearl???????? The Spanish jewelry line is a favorite among cool fashion girls for their hardware that blends tough and delicate feelings. angel @annaflorencelaplaca in the Amori Pearl and Mini Laurel Hoops ???? Personally, I'm a fan of stacking up my jewelry—earrings and necklaces are my jewels of choice. What I love about A/N/K Studios is that its designs offer a cool update to my everyday stacking pieces. Twenty-eighteen called—it wants you to wear seashell jewelry. Seriously, in a matter of weeks since launching, Wald Berlin's freshwater pearl and shell pieces have gone viral on Instagram, and now the brand is our go-to. I don't know about you, but I've already added something from each designer to my cart.